When approaching a new electrical design, there are many factors an engineer must consider. These are defined by the specification of the project: namely, whether the application is intended for industrial or consumer use. This decision has a considerable effect on the design of the product and is the basis for this article. Choosing between an industrial build and a consumer build is determined by the environment of operation and reliability required. Industrial products require high reliability while often operate in harsh conditions. A consumer grade electronic device may sacrifice some reliability to meet a cost requirement. Almost by definition consumer electronics do not operate in harsh conditions so the design is less about ruggedness and more about design, cost, and performance. Starting from the surface, the most obvious difference is the product enclosures (aka case) for industrial products are built more durable then the plastic most consumer electronics are enclosed in. The less visible differences are that the electronics (components and layout) and PCB within an industrial design will be more robust with thicker and stronger PCB materials, also adding coatings to the PCB to protect it from dust or other contaminants and sometimes even have redundancy in case of a failure. Components that have higher rated specifications for components resistors, capacitors, inductors, and other ICs will have higher tolerances as well as even higher current or signal response times. Selected devices with these higher ratings will come with a higher cost. Redundancy ensures that in the event of a power failure or device failure, the overall function of the device can still operate, generally for a short period of time until a replacement of the part is found. A consumer grade device will balance reliability and cost constraints to make the end product more affordable while operating in a less demanding and mission-critical environment than an industrial product. This article will reveal specific design differences between industrial and consumer-grade devices with a focus on the design of power circuitry, signal transmission/processing, and peripherals control. All designs have an input power requirement; usually, a direct current (DC) voltage is required to drive the electronics within any design. Any micro-controller that is in most electronics today uses a DC voltage. Similarly, most sensors, motors, and displays require a DC voltage to operate. The requirement of the DC voltage differs depending on the peripheral used for example a hall effect sensor can run off as low as a few volts, or it can be a powerful motor running off anywhere from 5v to 1000’s of volts. A simple toy motor will run off a lower voltage however a high-power elevator motor will run off up to 1000V or more. There are two ways a designer will get this DC voltage: it can be as simple as using a transformer and bridge rectifier to build a DC voltage from a 120/220VAC source, or using a battery which already delivers the DC voltage. Let’s first discuss the use of an alternating current (AC) input voltage source like a wall outlet which delivers 120vAC at 60Hz. Alternating current is better for transmission of power over long distances, however, most electronics require a DC voltage. Voltages vary depending on the application: standard voltages can be 48, 24,12, 6, 5, 3.3 or 3 VDC. Microprocessors often run at 3.5vDC; the devices that the controller is operating could use any of the other mentioned voltages. The point being that, in both industrial and consumer electronics, these voltages will need to be made. In both designs, this process can be as simple as a transformer stepping down the voltage, which is followed by a bridge rectifier. A bridge rectifier is diodes connected in a way to begin the conversion from the AC voltage to the DC voltage converting the AC voltage into almost DC voltage. A Resistor-Capacitor (‘RC’) network is then required to reduce the subsequent ripple effect, which means reducing the residual AC voltage. The best way to understand the process is first understanding what AC voltage is. With AC voltage, the voltage swings from negative to positive in a sine wave function. This voltage can be used in some designs but DC is required for the majority of circuitry in today’s electronics. A DC voltage is a flat line at the specific level required. So the transformer brings the voltage from the wall 120V to the desired level where the diode bridge essentially makes the negative swings to be positive, so instead of varying from -120V to 120V, it will only go from 0 to 120V. This is where the RC network stabilizes the voltage to the desired level, with lower quality components a small “ripple” can be seen and can affect some sensitive electronics. This is where the voltage regulators come into play to bring the level into the tolerance required. In industrial design, each component will be more robust due to the fact that more current is required to drive the larger components, also signal response times become important. These designs avoid the use of cheap transformers, and favor higher quality resistors and capacitors to create the most stable input power and properly deal with the heat generated, heat is generally created when switching high power to lower power as with the voltage regulators. Any current running through a resistance of any kind will create heat. While a perfect DC level may not be required for a consumer product, the DC levels for an industrial design must be kept within a 0.1V range, varying depending on the application. This creates the need for a voltage regulator; these may also be used in consumer products, however, the internal design of an industrial regulator chip is more robust than the cheaper consumer alternative. In a heavy industrial application, these devices will have a higher current rating as they run much larger motors and devices, causing the need for heat sinks. While a consumer electronics design can get away with a copper trace on the PCB as a heat sink substitute, an industrial regulator requires a large heat sink, and possibly fans, to cope with the heat generated. For the most part, a consumer electronic will not require a transformer; it relies on a DC input with a small transformer in the plug and generates the DC voltage used to charge the internal battery, subsequently powering the system. Even with a battery, a consumer product will utilize a voltage regulator to keep the voltage levels as accurate as possible. However, they will be rated for much less current and may not need a heat sink at all: often the PCB copper pad will suffice. Batteries do have a place in industrial applications; they will be much larger and usually different chemistry, for example, lead acid batteries in a car compared to the lithium-ion batteries in cell phones and most small electronics. These batteries can be used for primary power; however, they are more likely to be used as a backup for grid power. Large lead-acid or nickel metal hydride battery is more likely than a lithium or lithium polymer battery that would be used in a consumer product. The considerations here are usually based on size constraints with a consumer product; an industrial product can sacrifice space for reliability and larger currents in power designs due to the applications in which they are used. Once the proper power for the circuit is confirmed, the next step is to complete the design for the control aspect. This can be signal processing, checking inputs, or setting outputs. The most basic design uses a sensor to monitor something (there are many different kinds of sensors) and the system will react based on those sensor inputs. For example, a system may rely on a reed switch to sense when a magnetic force moves past to enable a motor to run. If the sensor malfunctions, it can cause the motor to be enabled when it shouldn’t. Therefore with industrial applications, it’s important to use the highest quality sensors to ensure the highest reliability. For the most part, the micro-controllers are the same depending on the applications; many consumer-grade Android tablets and cell phones have much more powerful controllers (aka CPU) than a controller chip used in an industrial product. Both an industrial and consumer device can use a powerful multi-core 64-bit processor, but sometimes a simple 8-bit processor is all that is required. This is purely based on the needs of the application. Consumer or industrial products can use the same CPU wafer inside the chip packaging, however, in certain applications with a lot of peripheral components more outputs on the CPU is required, which requires a different, and usually higher cost packaging. Simple controllers can use simple through-hole connections or surface mount connections to the boards which are lower cost. Sensors and outputs must be much more robust in an industrial application. For example, stepper motors in a CNC machine will be controlled the same way as a stepper motor in a consumer electronic, but a difference lies in the actual motor construction. In industrial design, the motor will be sealed and capable of much larger torque values than the basic stepper motor found in a simple consumer electronics. These electronics will be very similar, however, their construction will be much more robust with industrial applications. In a simple consumer product, a sensor can be placed directly on the PCB where an industrial sensor will need to be protected from the environment in which they will operate. A consumer product is usually just one device, however, industrial devices can span the length of a manufacturing plant and therefore have multiple parts of the system that connects to the main controller by wires or even wirelessly. 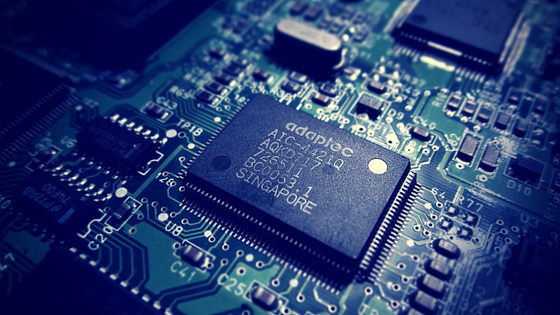 One of the more important considerations when designing an industrial application is the PCB layout and materials. With a consumer electronic, the PCB substrate can be a simple resin and reinforcement to create a dielectric (which is an insulator like rubber). An industrial PCB deals with higher currents; therefore, other materials are required to raise the breakdown voltage. Common materials are FR2, a phenolic cotton paper that is impregnated with a resin (a standard consumer based material), and FR4, a woven fiberglass cloth impregnated with resin (more commonly found in industrial applications). The next aspect of the PCB is the traces. In a consumer design, the power is not as high as that of some industrial applications, and therefore, the size and thickness of the PCB need to be determined. For example, a normal copper layer can be as small as 18 µm thick, whereas “heavy copper” can be up to 105 µm. The higher the current required, the thicker the copper trace will be. Thickness can vary greatly: on FR-4 substrate, 35 µm is often used, whereas, for higher currents, 70 µm is common. These thicknesses are determined when the PCB trace is designed. The engineer will select the proper size trace according to the situation. Different factors affect the decision like if the via (pass-through from one side of the PCB to the other side) is round or square and considerations are taken to ensure it fills completely when the boards are manufactured. In consumer designs, the traces are generally smaller since the power is much smaller, where industrial designs need much thicker traces to deal with the higher currents. Depending on the complexity and size specifications, a multi-layer board may be necessary to complete the design. A simple design can usually be completed with a single layer; a more complex design will usually be completed with 2 layer boards, while highly complex circuits can have 4 or more layers. Custom Android devices generally use 4 to 8 layer PCBs. Special considerations need to be taken in regards to multi-layer boards to ensure noise does not adversely affect the design. For example, power traces should always be kept away from signal traces because a signal trace is usually a small analog signal which can be affected by high power switching. Close proximity can subsequently give the controller false inputs. With proper PCB trace design, sensitive traces are protected from any high power switching or other sources of noise. The final consideration for a PCB design should be deciding whether a coating is necessary. The decision as to what coating is required and how thick is needed to be is based on how much dust, moisture, and other contaminants will be in contact with the board. A simple consumer design will generally not require a coating or use a very thin one, as it will be enclosed and will not be exposed to a dirty or harsh environment that could damage it. This is called conformal coating; the coating conforms to the different components on the board. The differences between consumer and industrial grade design described in this article simply scratch the surface. To summarize, the main differences are the need for redundancy in electronics, as well as the need for electronics that can deal with the higher voltages and currents of an industrial application. While the application may be similar between an industrial and consumer design, the need for industrial applications to operate in harsh conditions drives the electronics to be more robust than their consumer counterparts.